The second Van Yen cinnamon festival, themed “Van Yen luscious cinnamon”, will be held at the Central Stadium of Van Yen district, Yen Bai province from October 7 – 8. The district is aggressively marketing to attract tourists to the festival, Le Minh Duc – Vice Chairman of the Van Yen District People’s Committee – said on September 22. The festival will feature sports competitions, art performances, folk performances and sightseeing. Cultural activities of the Red Dao ethnic minority people living in the district will also be on show, including the 12-light Cap Sac ceremony (a rite of passage for boys), Pao Dung folk singing and Caumua (prayers for an abundant harvest) rituals. 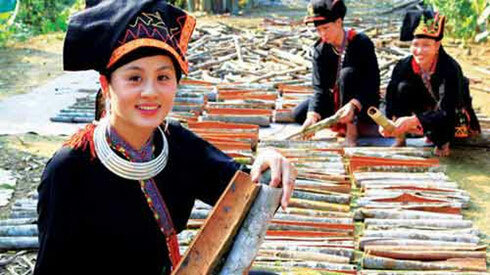 The festival will promote Van Yen cinnamon to investors, and boost tourism through introducing the Red Dao’s distinctive culture. After the first Van Yen cinnamon festival in 2015, total output of all cinnamon products increased: cinnamon bark from 7,000 to 9,000 tonnes, cinnamon oil from 280 to 290 tonnes, and cinnamon wood from 40,000 sq.m to 62,000 sq.m./.